Yannis, a cafe owner, is right: Leros is unusual, but in a good way. It is just a few miles from Turkey, but a million tourist miles from Kos and Rhodes, its Dodecanese siblings. It has mostly slipped under the holiday radar, which is a shame because it has everything we all want from a Greek island – beaches, fishing villages, tavernas, ruins – plus an extraordinary modern history. And for that we can thank Mussolini. The Italians grabbed the Dodecanese in 1912 and Mussolini later poured money, and cement, into Leros to make it the base for his imperial ambitions. A huge naval complex was built and a new capital, Portolago, emerged from a mosquito-ridden swamp. The town, renamed Lakki after the war, was left to rot for decades but the islanders have learned to love it and it is now coming back to life. The cinema(cineleros.com), for example, now beautifully restored, is very Cinema Paradiso. The second world war left its mark all over the island: in derelict military buildings with amazing murals painted by bored squaddies; and in tunnels in the cliffs (a history told underground at the War Tunnels Museum near Lakki, €3). Off the coast lie the wrecks of many ships and warplanes from the Battle of Leros, which inspired Alistair MacLean’s The Guns of Navarone. It also explains why most of us don’t know Leros. Mussolini’s former military barracks held political prisoners during Greece’s military dictatorship and became notorious mental hospitals. (They’re now a refugee camp.) These establishments gave islanders jobs, so tourism wasn’t such a big deal. But times have changed: the prisons and hospitals (though sadly not the camp) are closed, so tourists now focus on the island’s more conventional attractions. The Knights of St John reached Leros 600 years before Il Duce, and the Byzantine castle they conquered and fortified still dominates the island. It glowers over Alinda bay and its beach, the longest on the island. It’s a beautiful spot and the closest little Leros (it’s only about eight miles long) gets to mass tourism. There are many good fish tavernas in the area but locals rate Mylos, which has an amazing setting on the waterfront by a windmill. 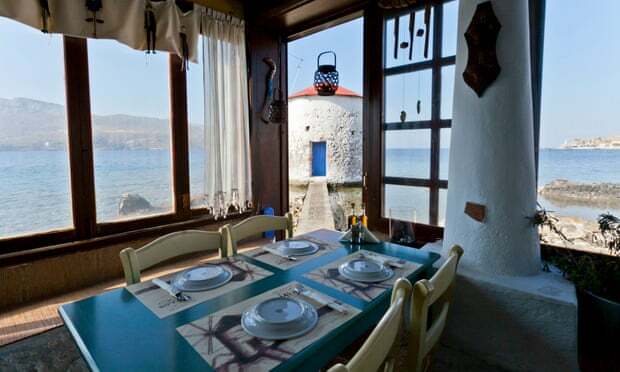 Like in most places on Leros, a meal for two here shouldn’t cost more than €50, often less. I love the nearby port of Agia Marina, with its ferries bustling back and forth between islands. It’s perfect for a leisurely coffee and some people-watching. If you summon the energy, a short walk up the hill is Platanos, the old capital, with a jumble of narrow lanes and white-washed houses. Panteli beach, below Platanos, is actually prettier than Alinda and I prefer it, largely because of its excellent restaurants, such as El Greco.